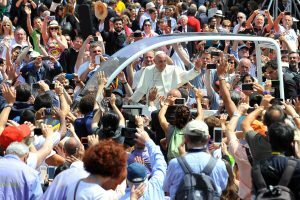 From 22 to 24 August, you will be able to attend the Pastoral Congress for the World Meeting of Families on the theme “The Gospel of the Family: Joy for the World” chosen by the Holy Father. The Congress will include an enriching program for adults with important speakers, workshops, lectures, testimonies and debates; a motivating and engaging program for young people, and fun activities for children. There will also be a daily celebration of the Eucharist, prayer activities, cultural events and music concerts. Get your strength from a good breakfast and head towards County Wicklow, known as the Garden of Ireland. In Wicklow you will love getting lost in landscapes full of flora and fauna worth seeing. Set amongst the lush hills of Wicklow, south of Dublin, you will enjoy walking among beautiful glens, beautiful waterfalls and transparent lakes. In addition to its spectacular scenery, hidden villages and stretches of pristine beaches, Wicklow is a historic place with elegant mansions and gardens. Do not miss Glendalough, a monastic site founded in the 6th century which, despite the constant Viking sieges, continued its activity for another ten centuries. Once you have made the stops you are interested in, get back on the road to the south and head towards Waterford. On the eighth day, we propose a day filled with options to dedicate time to what interests you most. After having breakfast in Waterford, we invite you to visit the renowned glass factory, where you will observe closely how they work to cut the glass into incredible pieces of art. The next destination is in Midleton where lovers of good whiskey will be in their element. 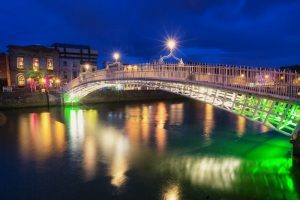 Once again, move on to a new destination to discover the historic city of Cork, which, thanks to its small size, invites you to explore its walking its streets and to mingle with its inhabitants in the traditional pubs and markets. To finish off an intense day, your accommodation awaits you in Killarney. On the ninth day of the trip, we invite you to tour one of the most beautiful and at the same time hospitable regions of Ireland, the Ring of Kerry, a place where you will discover the natural wonders that Ireland hides: mountains, valleys and lakes. Offering a varied range of colors. You can drive along the wide and dramatic coastline of the Iveragh Peninsula, passing through charming towns and villages like Killorglin, Cahirciveen or Waterville. In the evening, arrive to Killarney to stay in a guest house. A new day begins and it’s time to leave for Galway. 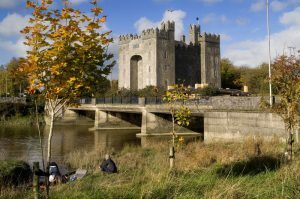 Along the way, you will pass by the pretty village of Adare and the medieval town of Limerick, until you reach Bunratty and discover its castle, which is an example of Norman architecture, fruit of the invasions and viking settlements. You can not miss the local Folk Park, where you will learn about the rural life in Ireland in the late 19th century. It has a wide range of domestic architecture, from simple cabins to elegant Georgian mansions. 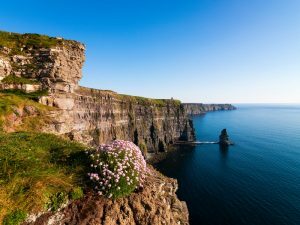 Continuing on the route in the direction of Ennis, you will arrive at one of the most impressive wonders in all of Ireland: the impressive Cliffs of Moher. Follow your route to Galway, known as the city of the 14 originally settled tribes, where you stay the night. A small and cozy city that, in the fifteenth and sixteenth century, played host to ships from Spain to trade. That is why, even today, monuments like the “Spanish arch” recall the good relationship between the two groups of people. After breakfast, we recommend that you head to the Connemara Region, north-west of Galway, famous for the wild beauty of its landscapes, lakes, mountains and hidden valleys. The wonderful landscape will accompany you throughout the tour, where you can visit the Connemara National Park. Irish red foxes and deer roam freely among mountains, marshes and meadows. In addition, the park houses remains of human civilization, like megalithic tombs of 4,000 years old. Do not forget to visit the magnificent Kylemore Abbey, which formerly belonged to the grounds that now make up the national park. Return to the city of Galway to stay the night. After these exciting days, you play back to Dublin, but you still have an interesting day ahead that will leave you with lasting memories. If you take the route through the center of Ireland, you will have the opportunity to visit an abbey and a monastic group in Clonmacnoise. In Mullingar, be sure to visit the Victorian house, gardens and Belvedere park, on the shores of Lake Ennell. These sites inspired Jonathan Swift, author of “Gulliver’s Travels”. Before you know it, you will have arrived in Dublin. Head to Ireland and take part in the World Meeting of Families to be held in Dublin from 21 to 26 August 2018. A unique opportunity to live together with your loved ones an unforgettable journey that will transform your lives forever. Can you think of a better way to spend your summer vacation? 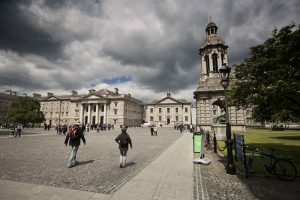 The Dining Hall, the Library Square, the Douglas Hyde Gallery, the Science Gallery and the Samuel Beckett Theater are just some of the attractions on this campus which offers the visitor a traditional and modern experience. Half an hour from Dublin lies Glendalough, a monastic complex created more than fourteen centuries ago, which is located in a unique enclave, possibly one of the most beautiful in Ireland and attracts a large number of visitors. 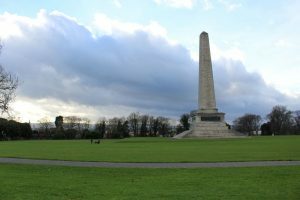 The site, one of the most celebrated on the island, was founded in the sixth century by the monk St. Kevin, descendant of the royal family of Leinster, hermit and saint. It is an impressive display of Ireland’s religious heritage which, during its history, suffered constant Viking raids. However, it continued with its activity ten centuries after its construction. Nowadays, the group stands out because it conserves more than twelve monastic buildings of century X, XI and XII. 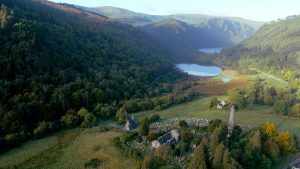 Let yourself fall in love with the incredible natural setting that surrounds Glendalough, between the Wicklow mountains, in the valley of the two lakes. Look at the beautiful shades in the reflection of the water and watch as the image is lost among the mountains. Duration of the visit: one and a half hours. Audio guides available in Spanish. The history of Bunratty Castle is the story of a fortification, which has been rebuilt again and again on its foundations and has witnessed clashes between different peoples. If the walls could talk, they would only tell part of the story. It is the grounds of Bunratty (which means at the bottom of the Ratty River) that have witnessed the clashes which have ended up collapsing the walls of the castle on three occasions. Normans, Irish and English fought in the area and destroyed the defensive building many times, resulting in the building which stands today. It is the most complete, authentically restored and furnished castle in Ireland. We invite you to come on in! In the vicinity of the castle, the Folk Park will amaze you with the recreation of what rural life was like in Ireland in the 19th century . Do not miss it! The Cliffs of Moher is one of Ireland’s major tourist attractions, located on the west coast of Ireland, about 260 kilometers from Dublin. It consists of an area of cliffs that are situated on the Atlantic Coast and extends for eight kilometers. They reach an impressive height of up to 214 meters at its highest point, to the north at O’Brien’s Tower. 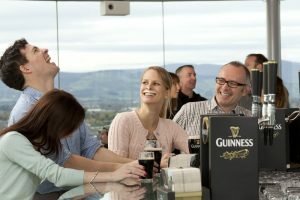 From the tower, you can enjoy a spectacular view of the Twelve Pins mountain in the north, Loop Head in the south and the Aran Islands in Galway Bay. A wonderful view! They are an impressive natural landscape – they have been nominated to be part of the 7 New Wonders of Nature – and is also a natural area for many species of birds. The Interpretation Center “Cliffs of Moher Experience” is a point of reference for discovering all the information on the cliffs. It is a space that uses renewable energy and whose design is in harmony with the environment. It awakens all your senses and a natural spectacle. Duration of the visit: 3 hours. Price per adult: approx. 4 euros. If you want to be even closer to the cliffs, you can visit them from the sea. You can take a boat that leaves from the town of Doolin. Once you have enjoyed the views from the top, this option will allow you to get to know the most interesting areas, such as the Great Raven rock, and see the thousands of birds that nest in the area. Some scenes from the movie Harry Potter and the Half-Blood Prince and Princess Prometheus were shot on the cliffs of Moher. Connemara National Park is one of six national parks in Ireland and main tourist attractions of the country, situated in the west of Ireland, in County Galway. Within the park you can climb Diamond Hill, from where you will behold one of the best views, including the only Irish fjord, Killary. It has an area of almost 3,000 hectares of mountains, peatlands, heathlands, grasses and forests. You can also find great diversity of birds, as numerous singing birds that nest in the trees. If you visit in winter, you will have the opportunity to see a greater number of species that migrate here from other parts of Europe. Although most of the mammals of the park usually hide in the presence of humans, you will be kept busy trying to find the traces and signs that indicate their presence. Be patient and you can meet them on your way. In addition to flora and fauna, you will also discover remains of human civilization in the park, such as megalithic tombs which are 4,000 years old. Much of the land was in the past part of the site of Kylemore Abbey, which is located within walking distance of the park and is also highly recommended. DDuration of the visit: 1 day. Diamond Hill hike: 3 hours. The entrance to the Park is located at the end of Clifden, in Letterfrack (N59). It is open all year, although the Information Center opens exclusively from March to October. In the centre there are exhibitions in 3D about the landscape uses, flora and fauna of Connemara. If you do not have time to visit it all, do not forget to visit the exhibitions to get to know the areas you are most interested in. If you prefer, you can visit the Park by bicycle to cover more ground.